In the beginning, God created the heavens and the earth. Now the earth was formless and empty. . . Being made in the image of God means we get a lot of his attributes, like the ability to love, and in my case, the desire to bring order out of chaos. 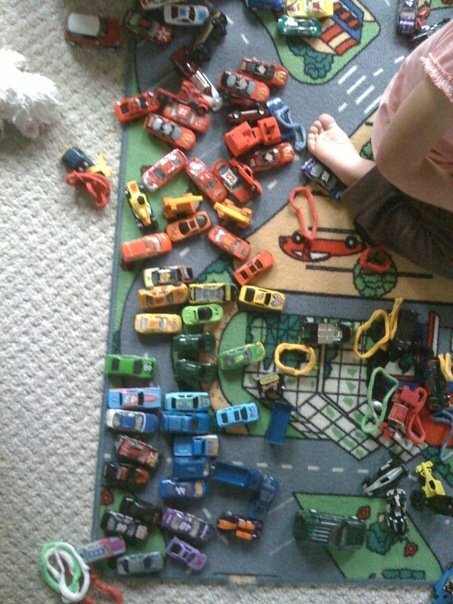 Babysitting a few years ago, I was sorting their cars… it was neater, but one of the kids drove through them. One thing about the autistic spectrum is that the brain doesn’t automatically prioritise the important things, and filter out the less important, which typically-developing brains do all the time to prevent overload. . . .
Also, the autistic brain can have difficulty with sequencing (this is an aspect of dyspraxia, which commonly co-occurs with Aspergers). Sequencing involves both prioritising and being simultaneously aware of all the actions in the sequence while giving priority to one at any one time. This creates a sort of mental overload. It requires a good working memory – that is, the ability to keep several things in your mind at one time as you work with them – and people on the autistic spectrum often have difficulty with working memory. Big tasks and projects always involve prioritising and sequencing. The advice people always give is ‘break it down into smaller chunks’, which makes sense in theory, but in reality involves deciding which chunks to break it down into – again, another prioritisation thing. Another aspect is that in deciding upon chunks, you often don’t know until you start on something what exactly it will require, and how much time will be needed. For me, this is a very overwhelming factor – it is about going into the unknown, and maybe getting lost there. Some people on the autistic spectrum have a spotlessly tidy house, and diligently keep it this way. I would love a spotlessly tidy house, but I get frequently overwhelmed by ‘stuff’ in my house. I call it ‘stuff’ because most of the time I’m barely aware of it as it accumulates and creates mess. I will be doing something – and whatever I’m doing requires me to take things out. And I like to lay everything out so that I can see it – otherwise I forget it exists! I leave it out because I think I may continue doing it – and then forget about it and bring something else out. Before long, there is stuff everywhere – overwhelming stuff, and I don’t know where to start and I have forgotten where most things were kept, and perhaps where they were kept wasn’t a good place anyway and I need to find a better place, and there are some things which maybe I should throw away, but that’s a big decision, and I don’t know if I can make the correct decision. — “‘I just assumed she was lazy’” on the blog Aspects of Aspergers. I also really appreciated her strategy of picking up ten things to take care of, rather than getting overwhelmed by the clutter and not knowing what to do with it all. Another thing I struggle with: “Context and non-transference of behavioral routines.” I totally identified with this post – she basically says that if you think of something you need in the car, you’ll forget to get it when you’re in the house. That reminds me of the study that shows that walking through doorways causes forgetting. Yes, that was a real study, and I find it simultaneously amusing and validating. Recently I’ve learned to set reminders on my phone for specific times, such as when I know I will be completely in the door and settled after arriving home (because, as we just discussed, if I’m reminded in the car or driveway I will forget by the time I reach the house and can do something about it!). I got a new iPhone for Christmas and I’ve found that Siri is wonderfully handy for safely setting a reminder like this while driving. And now for today’s story. A few times a day I go down to the basement to fill up my water bottle from the extra fridge and do other miscellaneous tasks. Last week I reached my breaking point with the state of the shelves at the top of the stairs (icing and mustard and soup and jam all together on a shelf- chaos!). I had organized it a long time ago, but the rest of my family doesn’t have the same compulsion to *put things in the proper place* that I do. So I decided that Saturday morning I would tackle that pantry cupboard. This happens every once in a while. My mom’s fabric stash in the neglected sewing room, the children’s books on the living room shelf when I was a nanny, the spice rack, even my current client’s DVD collection – if there is a group of related objects that are in a designated area and there is no discernible pattern or rationale to their placement, I’m going to react badly. It could be a quick fix: “Why are those two Curious George movies not with the other 5? I need to move that…” It could be something I’m not allowed to tackle: “No, you can’t organize my fabric until you help with more important things around the house.” (What on earth could be more important than sorting the fabric so all of the blues are together, and all of the flannels are in one spot. . . never mind the fact that nobody ever sees that room. I still get a little anxious thinking about that. It was a weird experience when Mom told me I had to wait, like a psychic pain.) Or it could be a job that takes all day. I cleaned out the pantry shelves, organizing and tossing expired goods as I went. I then reassessed the layout and made some practical adjustments. When I was done, I was in the ZONE and moved on to the next cupboard. And the next. It was a great example of autistic inertia. . . though unexpectedly having to deal with a pantry moth infestation used up more spoons than I had expected to need for the task (inertia? spoons? read here if confused). It was one of those times I was so focused and active that I forgot to eat and became shaky. One topic that occurred to me while cleaning was stimming – while grossed out by the pantry moths I frequently shook my hands or rubbed them aggressively. I’ve found that since recognizing my autism I’ve been more aware of my stims or desires to stim, and also more willing to embrace the movements. So if I’m at home in my kitchen and really excited about how the organized cupboard looks, I’ll let myself jump up and down or flap my hands briefly. Those are harmless and serve a purpose to my body and brain. We see nothing wrong with an excited child jumping and clapping – when does it become unacceptable for adults? Hey, it’s still acceptable for “big” excitements like being on a game show (Have you ever seen The Price is Right? Those people are always clapping and jumping up and down). So maybe it’s just NTs not understanding that sometimes little things can make us feel *that* excited. I’ve also noticed times where I subconsciously redirect the desire to stim. For example, in the noisy school cafeteria one day I became aware that my body had the urge to rock. I recognized it and allowed it to be suppressed, and then noticed that my leg had immediately started bouncing. I don’t ever recall consciously redirecting that desire to a more socially-acceptable stim, but there it was. I’m a frequent leg-bouncer, and assumed it was restless-leg syndrome, but now I know that it’s actually a stim. But anyway. . . I felt much better after the organizing, and my mom was thrilled. This entry was tagged Aspergers, autism, family, home, OCD, order, organizing, stimming. Bookmark the permalink. Hi, I found your blog through Musings of an Aspie…I’m a Pittsburgher, so your name caught my eye! It’s always nice to find new blogs by Aspie women and especially someone from my neck o’ the woods. I really appreciated that you wrote this post, bc I learned something new thanks to it…I’d never heard the issue of “sequencing” discussed the way it was here, and I also didn’t know that it was associated with dyspraxia. I’ve been struggling with this quite a bit lately, but didn’t have the right words to explain it to my therapist…so, thank you for that! (Somehow, “I can’t seem to make a decision and I don’t know where to start and it’s overwhelming, help!” doesn’t convey quite the same severity as the description from the article that you showcased.) Also had to comment because that organized pantry is a *thing of beauty* and it makes me happy just to see it. 😉 I loved your description of going on organizing binges and being “in the ZONE,” that is exactly how it feels! I *heart* organizing binges. Thanks for blogging and sharing your experiences! Hi! Thanks so much for your feedback. My mom loved the name “Schenley” after visiting Pittsburgh – one of my favorite things about studying/living/working out in western PA was not having to go through the whole, “Where did that name come from?” speech. People could even spell it correctly more often!